My kids love fruit. All kinds, all ways. They can't get enough. They also like crunchy snacks. 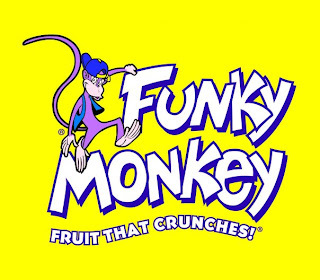 Funky Monkey calls itself "Fruit That Crunches!" so, naturally, I figured my kids would like these healthy treats. 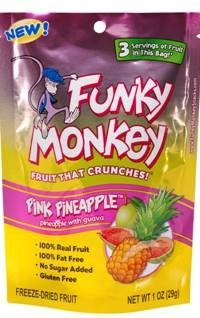 We received three of the seven flavors of Funky Monkey freeze-dried fruit snacks to try: Applemon, MangOJ, and Pink Pineapple. All were tasty but the Pink Pineapple pouch was gone in an instant, possibly because Bob and I liked them the best, too! The pineapple-guava flavor reminded me of the juice we always had at school growing up in Hawaii. The texture is crunchy and the flavor is intense. Funky Monkey makes a great lunchbox addition or after-school snack and I could even see using them as an exotic salad or yogurt topping. Become a Funky Monkey fan on Facebook! Follow Funky Monkey on Twitter! Disclosure: we received three pouches of Funky Monkey in order to write this review.